My husband is an avid cook and over the years has gotten progressively more creative. He gets on major food kicks where he'll discover a recipe, start making it repeatedly, and eventually employ a few modifications to make it his own. Earlier this summer, hubby began following Mark Bittman's VB6 regime, which basically means he eats a vegan diet before 6pm -- after 6pm he can more or less eat whatever he wants. Hubby looks great and professes to feel a lot better eating this way. While he rarely, if ever, eats bacon, he still totally craves its smoky sweet taste and crispy texture. So, out with the pig and in with the....eggplant? Hubby has become a bit obsessed about making vegan eggplant bacon every Sunday. He stumbled across a recipe for it on healthy eating website called The Vedge, and now has it bookmarked for easy reference. At first I was a little mean, turning my nose up at the whole idea of 'vegan' bacon. After all, I'm from Kentucky. Yet I wound up eating my words once I tried it. While it didn't taste exactly like bacon, it was pretty darn close and totally delicious to boot. 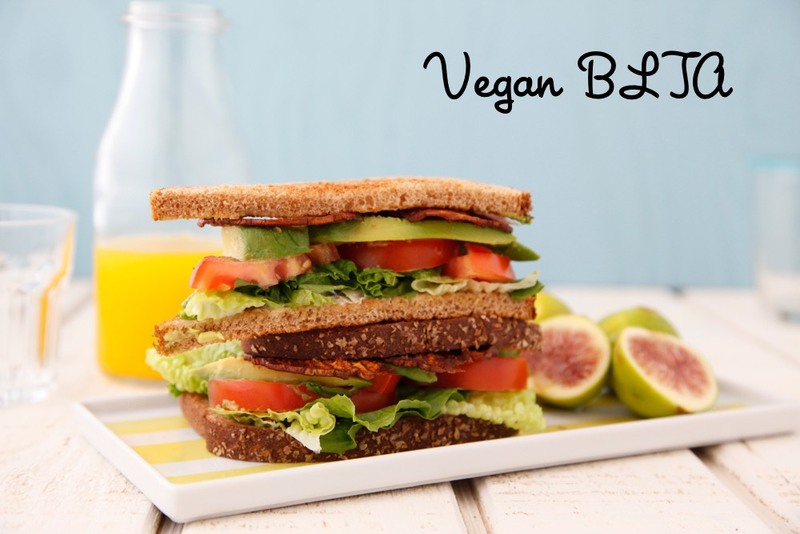 My husband made only minor modifications to The Vedge's recipe, but I gave it my own twist and then added it to a classic BLT with a few slices of avocado inside (the avocado is good for creaminess and giving flavor balance throughout). Vegan or not this flavorful, highly satisfying sandwich will leave you wanting more. 1. Whisk together the first 6 ingredients in a bowl or dish large enough to hold the eggplant slices. 2. You can peel the eggplant if you like, I prefer to leave it on but it is a little chewy. 3. Thinly slice the eggplant using a sharp knife or mandolin into 1/4 inch slices. 4. As you are slicing the eggplant, add to the bowl with the sauce allowing the eggplant slices to marinate for a few minutes until they soften. Press down to make sure all of the slices are coated in the mixture. 5. Place the softened eggplant slice on dehydrator sheets (or oven tray). You want as much of the marinade on there as possible. 6. To cook in a dehydrator, cook at 115°F – 125°F for 12-24 hours, depending on how thick your eggplant slices are. Mine took about 16 hours. To cook in the oven, preheat to the lowest setting (175-200 degrees). Place the eggplant on silpat or parchment lined baking sheets and cook for 2-3 hours or until eggplant is crispy. 7 Allow bacon to cool for 30 minutes to crisp up a bit. 8. Spread the veganaise on 2 slices of bread. 9. Layer on top of veganaise the lettuce, tomatoes, avocados, and 2-3 slices of vegan bacon. 3. Top with remaining pieces of bread. I really like the eggplant Bacon idea! I may not like the sandwich with everything you suggested but the Bacon is worth a try! That's awesome that your husband's doing Mark Bittman's program. I think any step towards eating less meat, more plants is a good one! &amp; incidentally, this is the first time I've heard of using eggplant for bacon, so definitely going to try it. LOVE THIS! please keep sharing more healthy vegan recipes!!! I just picked up Bittman's book. This recipe is well-timed for me! Looks delicious. This recipe looks terrific. I am a proud parent of two vegan boys. We haven't cooked eggplant like this before so I am very excited to try it. Thank you! do you think the eggplant retains any nutrition after being cooked for so long? I haven't been able to get eggplant to not taste bitter, until I started soaking the cut pieces in salt water for 30-minutes first, then rinsing and draining. I must give this a try? Catherine you have no idea what a bacon freak I am, I am so curious about this I am going to have to give it a try! Thanks, Catherine! My husband is vegan so this will be an exciting new meal for us. I am a big fan of weelicious! I hope you will keep posting vegan and vegetarian meal recipes! I just made this in the oven. It came out great! The kids love it. We are using to make egg, \"bacon\" and cheese sandwiches instead of BLTs. Thanks for the creative way to transform some of the eggplant we get in our CSA. on speciesism. Now being vegan for me is nointhg to do with the cruelty aspect, just that the use of animals is wrong.Many of my vegetarian friends in the UK are vegetarian because of the cruelty aspect. I heard a disturbing conversation though last week on a vacation back to the UK (I now live in Spain). I overheard my vegetarian friend telling her 6 year old niece the following: when I went vegetarian years ago, the animals were really badly treated, now there are laws to make sure they can go outside and have fresh air and space . By the way, my friend consumes battery eggs (in prepackaged food etc.) dairy from intensive cows, wears leather, and eats fish. )I wish WISH I had gone vegan years ago, but we can't turn back the clock. 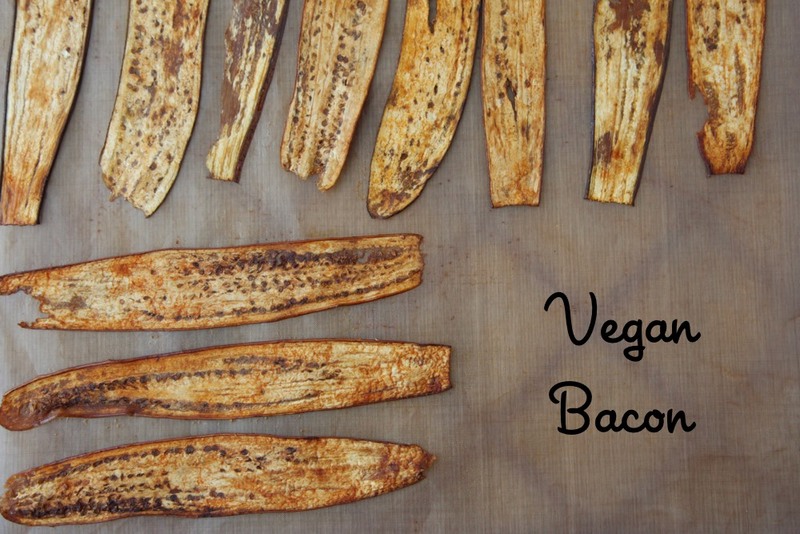 Oh, I love this idea for vegan \"bacon!\"